Beauty & the Beast(diamond edition)Deleted scenes. This is the deleted scene for the bibliothek & Verzaubert objects. 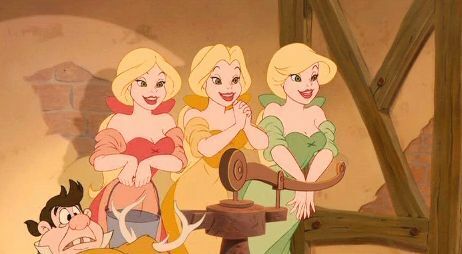 LOL the girl that’s voicing Belle here sounds like Cameron Diaz. Anyway enjoy. What a cute scene! I loved it! Those objects were very funny. I loved the Globe naming the seas. "The Alive Sea, the Dead Sea, The Emotionally Dead But Physically Alive Sea..."
And awwww, all the objects listening to her read King Arthur! It was sad watching the Beast listen to her as she reads about the last words Arthur says - it reminds me of the scene where the Beast is about to die and says "at least I got to see you one last time" or something. FILL IN THE BLANK: "Look there he goes, isn't he dreamy? Monsieur Gaston, oh he's so ___________! Be still my heart, I'm hardly breathing."